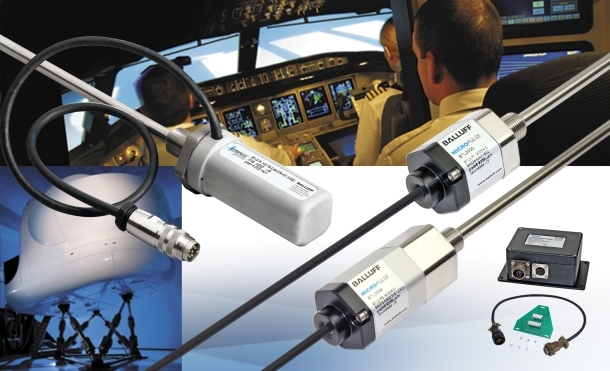 Balluff now offers a full line of Micropulse® magnetostrictive linear position transducers, specifically designed for compatibility with legacy flight simulator systems. Based on modern electronics platforms, Balluff’s Micropulse® rod-style linear position transducers give old hydraulic flight simulators new life with state-of-the-art performance, high reliability, and most importantly – ready availability in a variety of styles and sizes. Balluff’s linear transducers are designed for drop-in installation and full compatibility with the existing control system, right down to the matching host controller connector plug. Balluff’s patented auto-tuning circuitry allows operation with the most commonly installed legacy cylinder magnets. • Three different hydraulic probe designs for motion cylinder and control loading cylinder applications. • Two different electrical interface schemes to choose from to match the previous generation of transducer electrical signals. • The analog / PWM interface modules feature a menu-driven, microprocessor-based pushbutton setup routine supported by an informative, lighted LCD digital display. Take control today – ensure future availability for your flight crews by upgrading your troublesome legacy feedback systems with a new retrofit solution from Balluff, custom tailored for drop-in compatibility and backed by a committed supplier to the flight simulator industry.